The easiest way to sell online. Get more out of your small business website. Having an attractive, professional eCommerce website can help you sell more of the product and services you build your website to showcase. From flexible organization to great image options to trusted payment services, Web Stores from Webs offer the top-notch features that will help turn your visitors into buyers. And whether you're just starting out or you're seasoned online merchant, our intuitive eCommerce website builder will help you launch your store with ease, and sell with confidence. Add products and categories to help your visitors find what they need. Accept payments with Stripe or PayPal to give your visitors confidence in their purchase. Display products in an attractive storefront page that matches our 450+ templates. Serve a worldwide customer base with convenient global currency options. Custom Layouts - Choose the layout option that best displays your items. Store Search - Help people find what they need fast with search capability. Item Sorting - Organize your products in categories you can add to the navigation. Special Instructions - Ask customers for additional information if you need it. Product Images - Upload multiples images per item to show every angle. Secondary Options - Allow customers to specify things like color and size. Inventory Controls - Monitor your stock levels with ease and never run out. Coupon Codes - Engage customers and drive sales with a great coupon options. Create Sales - Create exciting sales that feature price-slashing graphics. 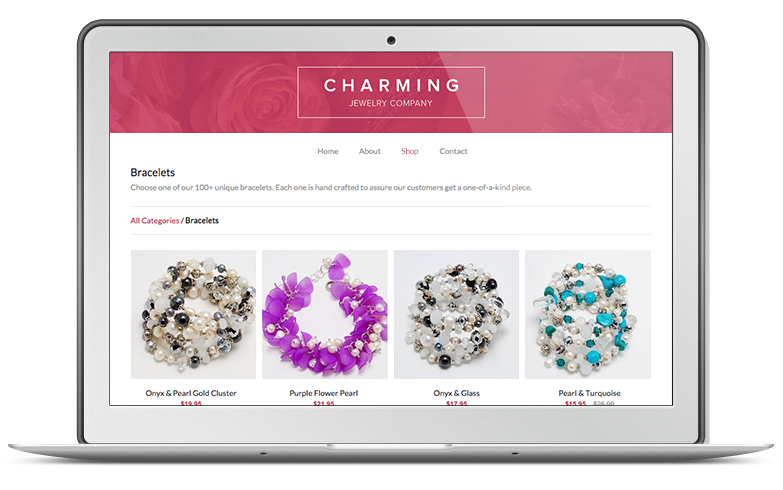 You are proud of what you sell online, you deserve a web store that shows it off. Ready to get started? Get helpful tips for small business websites and more from our resource centre.